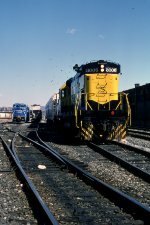 Description: NTV-9 stack train pauses with 3 C430s a C420 and a GP-18! Description: A mix of power lead WS-1 through the back alleys of Paterson. Description: WS 1 works a customer siding at Hawthorne, fighting its way through the weeds to reach the cars. Hard to believe, looking at this scene, that two mile long stack trains will soon be passing here. Description: The NYSW local is off in the distance in what looks like a rural setting, but which is actually in Paterson. Stack trains are coming to this line in less than a year. Description: WS 1 works through the back yards of Paterson as it makes its way to PC and Conrail interchange for the Southern Tier Line. Description: WS 1 passes an ancient semaphore that has not governed a train move in several decades. Still makes for a good prop. Description: An ancient relic of a bygone era waits for the passage of WS 1, way off in the distance. The train will take ten minutes to reach me. Description: BH 1 has picked up cars from the D&H and is now headed back to the NYSW yard behind recently arrived C 430 3006. 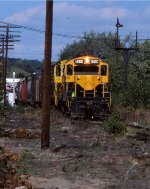 Description: NYSW 3006 rolls north past the site of YO yard, a small yard on the north side of Binghamton that handled traffic on the Syracuse and Utica branches. It is now the site of a frack sand transfer, but for many years, it was just a weedgrown field with scattered rail and ties. Conrail switches the Agway plant at right. The boxcars are inbound grain, which was still a surprisingly common way of receiving it at this location. Description: NYSW had lost a couple of C 430s to wrecks in the previous few years, but still had two that were worth saving. 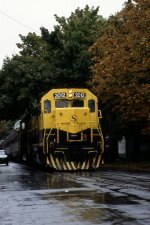 The 3000 had been in service for several years, recently getting a new coat of paint. 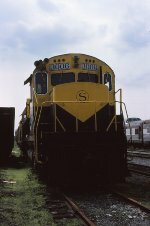 The other unit they kept was 3006, the John Treen, named for a long time conductor. Here it is at E Binghamton, getting a transfer out of the yard for the NYSW. Thats the old DLW yard tower at right. Like everything else, it was built of steel reinforced concrete, and designed for the ages. It was finally torn down around 2004 by CP. Description: NYSW 3006 sits in the sun, clean and in good paint. Description: NYS&W C430 #3006 on the point of BH-1 northbound at D&H Bevier St. yd., Binghamton, NY passing Agway elevator. Description: There was a time when a pair of Alcos such as this was not totally unusual, though there with only 16 C430s built, they did not widely mix. By 1990, ANY Alco was a notable sighting. Here we have two of the more unusual models, a C 430, and a high hood, steam generator equipped C 420, basking in the sun at East Binghamton. 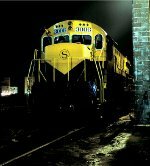 Description: C 430 3006 seen in a side view of the cab, with the lights of Cortland in the background.